Blue Moon Stables provides a safe and encouraging environment for beginner through advanced riders. Our riding programs have been designed to develop rider goals through a variety of programs teaching the same skills and rider development in different ways. These programs promote building confidence, motivation, discipline, coordination, focus and camaraderie, while still having fun and developing a compassionate bond with horses. Factors such as age, coordination, strength, frequency of lessons and attention span will impact students’ riding skill advancement. Progress is best achieved through riding consistently; we recommend riding at least once a week regularly for best results. However; for many riders, progress is seen in other forms in everyday life almost immediately, like confidence, coordination and problem solving. We strive to offer something for everyone! Some lesson packages are age-specific. For children ages 4 to 6, we offer the Little Britches early horsemanship program, detailed below. Also detailed below, is the Rising Stars Riding Academy for riders 6 to 10 (Academy groups for ages 10 and up may develop in the future.) Year-round groups for ages 6 to 106 ride in weekly lessons throughout the calendar year. Private and Semi-private lessons are offered throughout the year, and work best in combination with group lessons. For adult riders and owners looking for “refresher” lessons, training tips or to start a new group, we have a something for you, too! For a rider with some experience, the first step to entering one of our programs is to schedule an “Evaluation Lesson.” This half-hour private lesson is designed to have one of our instructors assess the individual riding skills of the new student to properly place them in a group according to their riding level. If the student is not yet comfortable entering a group, they will be offered the opportunity to enroll in our “New Rider Package”. Why do we give group lessons? Group lessons are taught in groups of 2-6 horses. There are many benefits to learning in a group lesson versus a private lesson. Riders in a group have the ability to watch their peers and learn from each other as well as the instructor. Group lessons also encourage building friendships with other people who enjoy doing what you love. Good sportsmanship, discipline and confidence are built up more effectively in group riding. Groups can be made up of riders of similar skill-level or a range of skill-levels, depending on the desired rider goals. Riders may choose to form a mixed skill-level group of friends, family members, or neighbors. This is a one hour private lesson is designed to evaluate the riding skills of a new rider (with some experience) entering our riding academy or regular lesson groups to properly place them in a group lesson with students of a similar age and ability. The Rising Stars Riding Academy is designed to make it easier for more children to have hands-on horse experience without long-term commitment. The current curriculum is geared toward 6 to 10 year olds. The schedule offers rotating programs for different levels of riders, allowing students to progress at varying rates. It is a group lesson that only runs 5 or 6 weeks at a time. Some students will prefer to walk and trot only, whereas others may be eager to canter as soon as they have passed skill tests. All academy classes will be a combination of safety and balance, mounted drills and games, horse health and anatomy, equipment identification and breed and color identification. The final lesson of each session will be a small performance where family and friends will be invited to attend. At the end of any session, riders may choose to continue in the academy or try the regular lesson program. Academy classes will be a 60 minute class. Actual riding time will vary. Year-round group lessons are one hour long and include between three and six riders, and continue all year. Riders are placed in groups based on age and ability. Riders must be able to control their horse at a walk or walk and trot to enter a group. Once placed in a group, riders must purchase a package of 5 or 10 to maintain their weekly group reservation. Special groups are formed from time to time, examples are home-schooled groups, mommy groups, mommy and me groups, and 40s, 50s and 60s groups. Call for special group sign up! This package is designed to jump start new riders to our program with instruction in a private lesson with the goal of entering a group at the end of the package. It consists of 4 private 45 minute lessons, and may not be available certain times of the year. Academy will only need to complete the evaluation lesson prior to entering an academy class. This program is designed for boys and girls who are not quite old enough to enter the riding academy or regular lessons but are interested in horseback riding. They must have reached 4 years of age by June 1. It is a comprehensive program which will teach young children the basics of riding with the skills they need; they will learn to groom, tack-up and take care of a horse/pony. There are 6 thirty-minute lessons with a maximum of four children. Upon completion of Little Britches, students should be able to continue with Little Britches, join an academy class, or enter a year-round group with instructor approval. Private and semi-private lessons are only available to riders already enrolled in group lessons and wish to have additional, more intense sessions. Private lessons are 30-45 minutes and semi-private are 45-60 minutes. Semi-Private lessons are with another student of similar age and ability, and can be very advantageous for carpooling and social interaction. All private lessons are only with instructor approval and are subject to availability. Q) How do I schedule a lesson? A) Please email bluemoonstables@gmail.com or call (270)957-0234. Q) What is your cancellation policy for lessons? A) All lessons need to be cancelled within 24 hours of your lesson or you’ll be charged the full price of your riding lesson. Q) How do I pay for my lesson? A) Full payment is due the day of your riding lesson. We sell sets of lessons for your convenience, available on our website. Q) Do I need to have a helmet before I come to my riding lesson? A) No, we have clean helmets you can borrow. But would recommend getting a helmet if you plan on riding regularly. Bike riding helmets are not allowed. Q) Do I need to have riding boots before I come to my riding lesson? A) No, if your child has a boot with a ½ inch-1 inch heel, that covers your ankle, and has a pointed toe they can ride with that boot, tennis shoes are not allowed. Q) Is there anything else I need to wear for my riding lesson? A) Please come in jeans, leggings, or riding pants. Shorts are not allowed. Please come dressed to accommodate the weather. Q) Do you offer make-up lessons if I cancel a lesson? A) Blue Moon Stables does not offer make-up lessons. Considerable time goes into planning lessons with instructors and reserving horses for riders, therefore it is the responsibility of the rider to come to lessons and be on time. Q) What happens if my instructor needs to cancel a lesson? A) If an instructor needs to cancel a lesson, a make-up lesson will be re-scheduled at the convenience of the rider. Q) What’s an Evaluation Ride? A)It is an initial first lesson, mandatory for every student wanting to join a group. In this lesson, our instructors educate the student – step by step – on the grooming and tacking up process. Then the student is evaluated riding the horse. Q) Are there pony rides? A) Yes, some Saturdays or Sundays from 11-1. $10 per ride. Please contact us for a reservation, you can also check our Facebook page for weekly schedules. 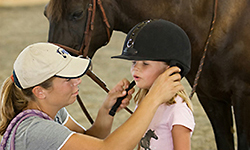 Q) As parents of riders, where are we allowed to go during riding lessons? A) We insist you allow you child who is riding to focus on his/her instructor. Please resist the urge to speak to your child during instruction on the ground or in the saddle. Riding lessons are a great way for people- especially children- to learn confidence and accountability, and our instructors are well trained in teaching them. The ‘Kentucky Room’ is available for waiting, and there are even toys for small children to play with. The patio is available in nice weather, or you can stroll around and look at the rest of the farm. We allow walking and running on marked roads on the farm, just ask for permission, please!